Let’s Go: A G_dot Prequel is a play about everything that happens before Estragon and Vladimir of Beckett’s Waiting for Godot start well, waiting for Godot. The concept itself is genius, however; the pieces didn’t come together as nicely as I would have hoped. We are met with two familiar faces at the top of the show. Vladimir (Didi) and Estragon (Gogo) who ride in on their vintage two-seater bicycle with smiles as wide and as bright as crescent moons. The show gets off to a fun and promising start. The design of the show itself (by Chelsea Driver and Elizabeth Asselstine) is incredibly accurate both to the time period and to the style of the play itself. The aesthetic is perfect, from the empty black brick walls of the TPM backspace to the dusty black boots Didi and Gogo stomp around in. Robert Fothergill pens a witty script, full of clever quips and silliness in the true style of Beckett. It hits all of the marks from a technical standpoint and there is some really good character development and plot points written right into the dialogue. The script is clever, well-thought out and strong enough to carry the audience through what turns out to be a bit of a humdrum performance. This is where Let’s Go fell off a bit for me. There wasn’t enough emotion and I guess you could say…gravitas behind the lines (as witty as they were) to fully sweep me up in the journey that is this Godot prequel. 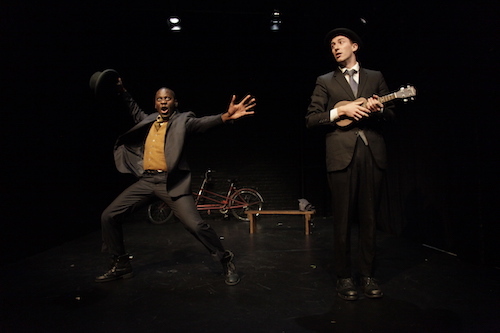 Our Estragon and Vladimir certainly looked the part as vaudeville performers of the early 1900s, with their period-appropriate top hats and their mid-atlantic accents. They were generous enough with their volume, physicality and speed…but I couldn’t connect to these characters for some reason and noticed a lack of chemistry between the pair as well. I understand that the style of the play is supposed to be quick, snappy and maybe a bit dead-pan, but I found myself wanting so much more from the performance itself. The actors seemed to be sailing through the text making it feel more like a recitation than a performance tied with real feeling and human emotion. The best way I could describe it is that there was a presence missing. I will say though, there are definitely some funny moments here and there, like when our Vladimir, played by Brain Haight, purposefully doesn’t say the capital of Belgium or when Estragon’s girlfriend Mary (played by Heather Marie Annis) drinks her champagne so gingerly and lady-like that she nearly chokes. I was giggling but it was mostly at the word play and clever lines that were written in as opposed to the execution of the humor. I had high hopes going into Let’s Go: A G_dot Prequel. The concept alone was enough to pique my interest and although I thought certain elements of the production were strong, I don’t think the most important element of all — the performance measured up, making for a bit of a lacklustre experience. Playing from September 27-October 8, 2017. Photo of Brian Haight and Tony Ofori provided by Fook Communications.